A few days ago, I was craving pizza for lunch. I considered hitting up Papa John’s but decided I’d rather eat something healthy. I went to the kitchen and started looking around and almost made myself a peanut butter sandwich but then I remembered a recipe for pizza crust made from self-rising flour and greek yogurt. I only had white self-rising flour so I just added some salt and baking powder to my white whole wheat flour, stirred in some greek yogurt, and water and voila! Pizza crust. 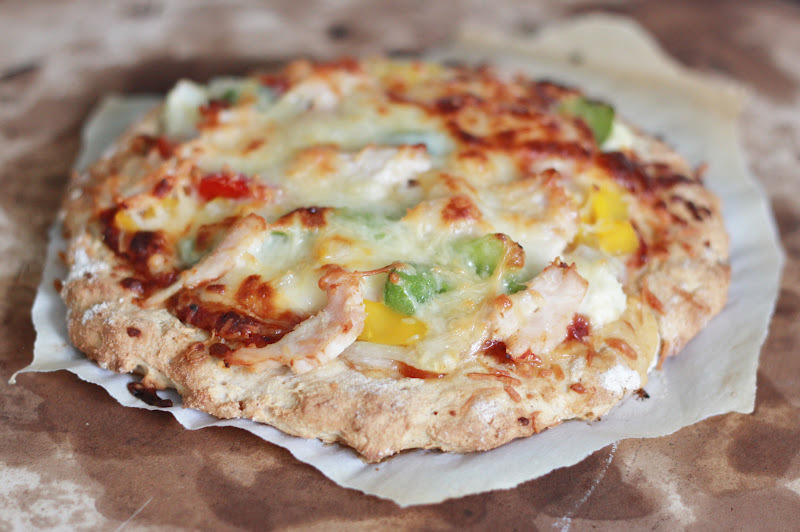 =) I topped my whole wheat crust with tomato sauce, lots of veggies, and some chicken breast. Oh yeah, and maybe some cheese. Cheese is super healthy too, right? I mean, it’s dairy ;). All things in moderation. My pizza was certainly healthier than any pizza I could have ordered I’m sure. And while the crust wasn’t hardly as good as my favorite yeast pizza crust, it was certainly faster. 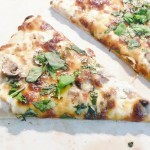 In the time it takes to order pizza and pick it up, you could make this pizza from scratch! Enjoy! 1. Preheat oven to 500 degrees and place baking stone in oven. Combine flour, salt, and baking powder in small bowl. Stir in greek yogurt and water until mixture forms a soft dough. 2. Turn dough onto piece of small parchment paper. Using lightly floured hands, form dough into desired shape. Top with sauce and desired toppings. Bake on stone until golden brown, 15-20 minutes. Makes 1 man-size serving or 2 smaller servings.